I discovered a Bridal bouquet secret. It will make your floral arrangement pop. Bridal bouquet . An added touch with Swarovski Crystal beads. I've created beaded branches to accent any bouquet. These beaded gems sparkle and glitter in the light. A must have for any flower arrangement. If you do not have time to make these gems, or you feel your not creatively inclined, you may order them form me. They come in packages of four with six inch stems so they can cut shorter if needed with wire cutters. 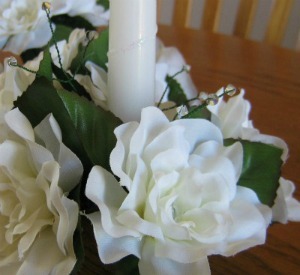 All you need to do is push them into the base of the bouquet between the existing flowers. In the photo below you can see, I also placed a few branches of crystal beads into the unity candle that I made for my friend's wedding. It added a nice sparkle to the piece. Then I placed a row of glitter glue around the candle to add some elegance to an otherwise plain white candle. sun catchers you may ask? I have some photos below and I will explain how I made them. All you need is some wire cutters, 28 gage wire and some beads that glitter. Mirror tile with a hole in one corner work the best. They catch the sunlight and sparkle. Add these beautiful clusters of BLING to your bouquet. These genuine crystals twinkle in the light. Put a finishing touch to your already gorgeous bouquet.